White with the dazzling white which only whitewash can give, and beside which all other whites are gray, the square prim lighthouse tower enhances and deepens the blue of sky and bay. The keeper's home is a chalet-like cottage, from whose walls slope the grassy banks, pretty with flowers, down to the rocky shore. What a contrast is the berth here to one in the wave-shaken tower on Minot's Ledge, or in an ever-tossing lightship over some lonely shoals! -- Edmund H. Garrett, Romance and Reality of the Puritan Coast, 1897. Circa 1872. The balconies on the house were removed around 1890. The promontory called Hospital Point, in Beverly on Boston's North Shore, derives its name from a smallpox hospital built there in 1801. The hospital, used as a barracks in the War of 1812, burned down in 1849. It's believed a watch house was previously located there as early as 1711. The area was the site of an earthwork fort that saw action in the fall of 1775 when the British ship Nautilus fired on the town. Cannons at the point and at Fort Lee in Salem were fired at the Nautilus, which ran aground as the tide fell. The vessel escaped when the tide rose again. Beverly was an active port for both trade and fishing for many years. But it was the maritime commerce of neighboring Salem that led to the establishment of a lighthouse at Hospital Point. The Lighthouse Board requested funds "to complete the lighting" of Salem Harbor in 1869, and $30,000 was appropriated by Congress on July 15, 1870, for that purpose. 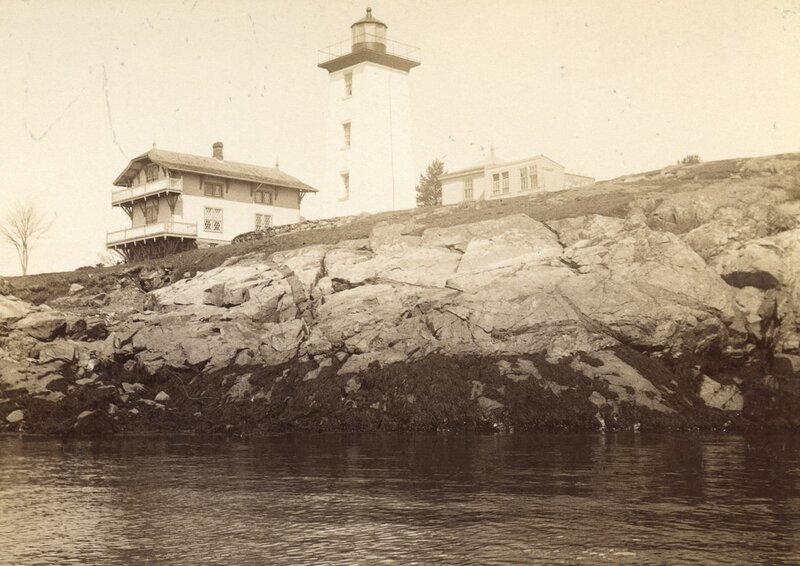 Early image of the light station, from the National Archives. The appropriation paid for lighthouses at Salem's Derby Wharf and Winter Island (Fort Pickering), and at Hospital Point on the north side of the channel to Salem Harbor. A temporary light was exhibited at Hospital Point beginning on May 1, 1872. By the following year, a 45-foot- square brick lighthouse and adjacent two-story keeper's house were completed. The keeper’s house still stands, with major additions made in 1941, 1968, and 1986, and much of its original trim removed. A brick oil house, built in 1902, also still stands. A garage was added to the station in 1942. 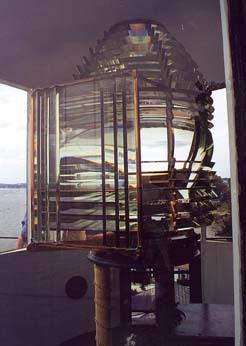 The lighthouse was provided a 3 1/2-order Fresnel lens (right), a rare size in New England. A condensing panel was installed in front of the lens. Because of this panel, the light diminishes in intensity if a mariner veers from the main channel. The panel is considered unique in American lighthouses. The longest serving keeper at Hospital Point was Joseph Henry Herrick, who served from 1873 to 1917. Herrick was a Beverly native who had worked as a shoemaker in the city, and he was also a veteran of the Civil War. Besides its importance as an aid to navigation, Hospital Point became known as a sort of lovers' lane. One local newspaper reported in the early 1900s that "Many a Beverly maid's heart was lost and found on the rocks beneath the faithful light." On May 1, 1927, the lighthouse officially became the Hospital Point Range Front Light. A rear range light, created by adapting discarded lightship equipment, was installed in the steeple of Beverly's First Baptist Church, a mile away. The light, seen through a window in the steeple, is 127 feet above mean high water. The additional light was lined up by incoming mariners with the front range light, as an added guide to Salem Harbor. 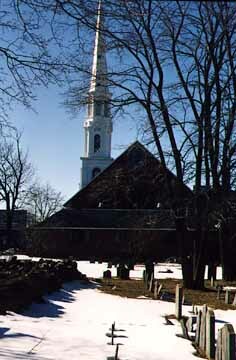 The steeple was the only part of the church to survive a disastrous fire in 1975. Don Decker, a former Coast Guardsman who serviced several lighthouses in the area, said that his least favorite light to service was the Hospital Point Rear Range Light in the church steeple. The steeple was a favorite nesting site for pigeons, making it a very unpleasant place to visit, said Decker. Arthur Small, whose wife was killed at New Bedford's Palmer's Island Light in the hurricane of September 1938, became keeper in 1939 after he had recovered from his own injuries. During World War II, Keeper Small maintained a shore patrol in the area and had to check the lights at Derby Wharf and Fort Pickering in addition to Hospital Point. The keeper's dwelling was altered in 1941 to provide barracks for 20 men. The lighthouse was automated in 1947, and since then this tidy lighthouse station has been home to the commander of the First Coast Guard District and his or her family. One night the beacon went out, and I felt as though I should put a lantern in the tower, as they did in the old days. But a repair team from the Salem station came over and repaired it immediately. While the lighthouse is easy to drive to, the grounds are not open to the public, with the exception of one day each summer when an open house is held as part of the week-long Beverly Homecoming celebration. The Coast Guard Auxiliary may also open the lighthouse on other occasional dates. A good but fairly distant view can be found from Salem Willows Park in Salem, and some cruises in the area pass nearby. Members of Aids to Navigation Team Boston who helped with an open house on August 6, 2000. L to R: EM3 Geoffrey Mongillo, QM2 Stephanie Whitcomb, and Seaman Darrell Feeney.